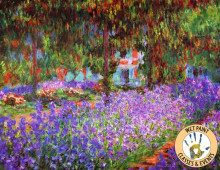 Have you been inspired to try painting by the works of the Impressionists but didn’t know where to start? This class! You’ll be guided through the main stages of creating painting in the style of Claude Monet, while being introduced to the materials, tools, and basic principles of acrylic painting. Absolutely no art experience required! Bring the photo of the garden you would like to paint to the class. If you don’t have photos, there will be photos available in the class.